The 10 Best Caterers in West Virginia! 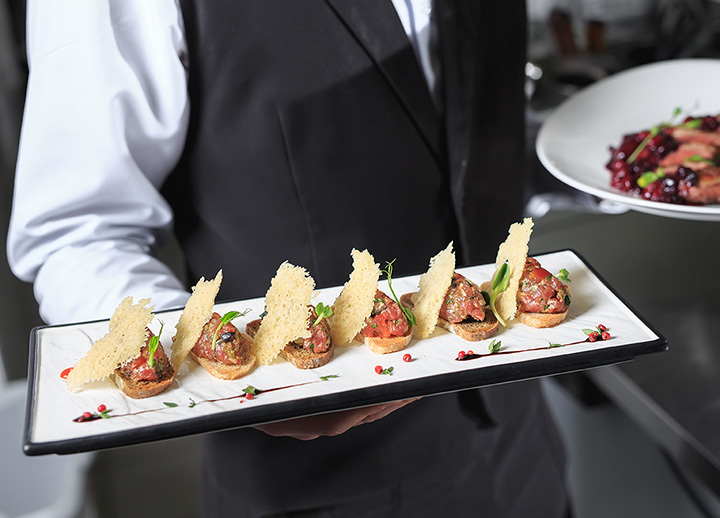 Hosting a social event is a big job and hiring a caterer to work with you can relieve stress, and give you the chance to enjoy your guests without the hassle of doing all the work. Whether you’re planning a wedding reception, family reunion, birthday or graduation party, or a business luncheon, these great West Virginia caterers will give you almost unlimited choices for delicious and customized menus that are sure to please your guests. Let’s Eat in Huntington, West Virginia, is a great little place to stop by for lunch, but they do a fantastic catered spread and are available for your next food event. They have a unique sandwich called a Naanada, which is a fluffy flat bread grilled and filled with your favorite ingredients. Portions are huge and ingredients are locally sourced and made in house by hand. Friday’s are deal days with discounts on sandwiches in the store. Let’s Eat will be the talk of your next catered event with their reasonable per-person pricing, great menu selections, and friendly services. Owned and operated by a foodie with a flair for the creative, Bella the Corner Gourmet is like nothing you’ve ever seen before! As soon as you walk through the door at this Lewisburg eatery, you’ll see unique gift and food items for the kitchen. With over 100 wines, craft beers, and ciders, it doesn’t stop there. They also have customized gift baskets that include anything from artisan cheeses to beautiful wooden pieces and pottery. Available for light catering events, the goal of this one-of-a-kind eatery is to make food fun and playful. Popular at state fairs and festivals, Ridge View BBQ has a sit-down location in Institute, West Virginia, but is ready to cater your next event. Offering delicious barbecue and all the fixin’s, this is the place to call for the best food and service year-round. Whether you need a caterer for a formal event, a family reunion, or business lunch, you won’t be disappointed by the quality of the food or the prices. Dine in, carry out, or a catered event, Rollin Smoke BBQ in Charleston is one of West Virginia’s most talked about barbecue caterer on social media. Business events, weddings, graduation parties, birthday parties, showers, reunions, or sporting events, let Rollin Smoke BBQ do all the work so you can enjoy your guests. Providing several options for quantity of food and pricing that fits your budget, you can also order tables, chairs, and other party supplies, making this a one-stop place for your next event. If you’re looking for a custom cake caterer, contact Susan Hicks at Suzcatering in Barboursville, West Virginia. With over 30 years of experience catering sweet things, you’ll find an expert with extensive knowledge and creativity who uses the best ingredients and most modern techniques and trends to present incredible events for your special occasion. Winner of several multi-year awards including WeddingWire’s Couples’ Choice and The Herald-Dispatch’s Best Caterer in the Tri-State, no job is too large or too small. Food makes an event, and food is the star of the show at the Wild Poppy Caterers in Dunbar, West Virginia. With an attention to detail, the delicious food trays filled with fresh and tasty sandwiches and wraps are a great change from most catered platters. Using only the freshest ingredients, the goal is to offer a delightful eating experience at reasonable prices. Love Mediterranean food and looking for a unique way to celebrate your next event? Let Taziki’s Mediterranean Café in Morgantown cater it for you. With items like homemade hummus, signature pasta, and a great selection of salads, chicken dishes, and pitas, they can create a custom menu for any size or type of event. Delivery is fast and they can set up a delicious buffet that includes the tablecloths, serving dishes and utensils, and servers. For outstanding service and food that includes breakfast, lunch, and dinner options, Shepherd University’s Catering Department can cater your next event. Located in Shepherdstown, West Virginia, any size event is possible with guidance and collective experience of this team. Banquets, buffets, receptions, you name it and they can cater it. Minimum orders are required and linen rentals can be included for a small additional charge. The name says it all. As You Like It Catering in Wheeling, West Virginia, brings a level of elegance to your social event that is second to none. With appetizer choices like baked almond brie, caviar pie, and poached salmon, to entrée and dessert selections like beef tenderloin and leg of lamb and banana split cake and triple chocolate fudge cake, your guests will be talking about this for a long time. Exquisite food and exemplary service is what you’ll get when you use As You Like It Catering. With a well-known reputation as a premier bakery, Fannie’s Sweet Confections in Huntington, West Virginia, offers full menu catering services, too. They can provide decoration assistance at your chosen location and have an event planner that will help you plan your special event from complete meals to custom-made food bars to party platters. Pricing is available in several budget-friendly packages.